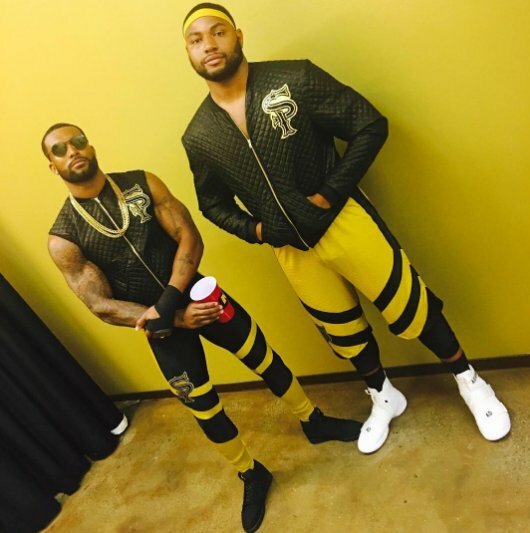 I’m not sure how I should feel about the Street Profits. There’s a lot to like about them. They look like they’re having fun in the ring. Montez Ford could easily be one of the most exciting Performance Center products in a long time. Angelo Dawkins might actually do something meaningful now after being stuck in developmental for almost half a decade. But I can’t get behind their gimmick. As much as WWE tries to appear more inclusive now, stereotypes are still abundant in the company—hell, even the whole industry. Stereotypes, as much as people might hate them, exist because they work. The over-simplification of an identity or culture allows people to easily pick up on what the writers want you to see. But it’s this boiling down to one easily identifiable characteristic that we should be furious about. It’s easy—dangerously easy—to brush off Dawkins and Ford as millennial Cryme Tyme, and yeah, they are both racial and generational stereotypes. We know so little about them aside from them being young African-Americans who like posting on Snapchat and drinking liquids from red cups. You see them, and you think you know what they’re all about, and that’s a shame because it shouldn’t be all they’re about. In a time when #BlackLivesMatter exists and the U.S. is ruled by a man-child who hates everything not rich, white, or old, there’s so much storytelling potential in this rich, complex, nuanced struggle of class and race. This gimmick, as it is right now, just isn’t cutting it. Being a young African-American in the U.S. shouldn’t be all about posting on social media and drinking from red cups. Just like Cryme Tyme exaggerated the perceived criminality in low-income African American community, the Street Profits represent the worst of middle-class millennials: apathetic and egocentric. Right from the get-go, the gimmick fails to present itself as anything other than a one-dimensional caricature. The biggest shame in all of this is that NXT had proven itself capable of looking past race before. Hideo Itami, Asuka, Shinsuke Nakamura, Akam, Rezar, Andrade Almas; these names are proof that not being white or American should get you a stupid, misinformed racial gimmick. I want to cheer for the Street Profits, I really do. They’re young, exciting talents who should’ve wowed me with their debut. I just find it hard to believe that this is all whom they could be. There is potential in this tag team beyond what they could do in the ring in the socio-political context. They could be great team that stands for something greater than a hashtag, but for now, they’re just memes. SAnitY beat down the Authors of Pain: This felt right. Seeing Eric Young back and leading his squad of anarchists was great. It reminds people how dangerous SAnitY could be, and it adds a dash of vulnerability to the champs. Rezar breaking off the guardrail to get to his partner was great; and Killian Dain throwing the title at the fallen Akam was even better. I am now officially excited for the Tag Team Title match at TakeOver: Brooklyn III. NXT Champion Bobby Roode confronted Drew McIntyre, Roderick Strong interrupted: Roode was easily the star of the segment, as he always is in these kinds of segments. McIntyre played the role of taciturn badass and Strong delivered much of the emotional beats in this segment, roles both men played well. It’s just hard to when they’re standing in the shadow of the Glorious One in his A-game. He looked like a great manipulator here, and his smug delivery as he worked everyone just made me wants to punch him more. From coming out with security, to dressing down both McIntyre and Strong with his words, and finally forcing Regal to make the Strong/McIntyre match for next week, it was a masterclass at being a great heel champion. Danny Burch def. Oney Lorcan: This match wasn’t as exciting as their first one, but it made sense. Burch learning from his loss and fighting his way into the surprise victory is a great way to give both guys their respective wins and leave a space for a rubber match down the line. I know WWE just did a similar story a year ago, but I would love to see Lorcan and Burch team up, maybe for the Dusty Classic. Andrade “Cien” Almas (w/ Zalina Vega) def. No Way Jose: The Almas/Vega tandem can go either way for me. It’s great to see Almas add a bit more to his gimmick, and Vega does a good job at adding wrinkles to Almas’ tranquilo schtick, but easing up on the same character might take away from the very thing that got people excited about El Ídolo. I do want to learn more about how they’ll proceed with the Almas/Vega relationship, as that’ll help put the gimmick over. Also, a match with Johnny Gargano should be a great TakeOver opener for Almas, and one he could possibly win. There weren’t many matches this week, but it felt busy. The SAnitY/AoP segment as well as the Roode/McIntyre/Strong one were great and made both the Tag Team and NXT title matches more interesting. Burch and Lorcan delivered in a solid midcard match as well. 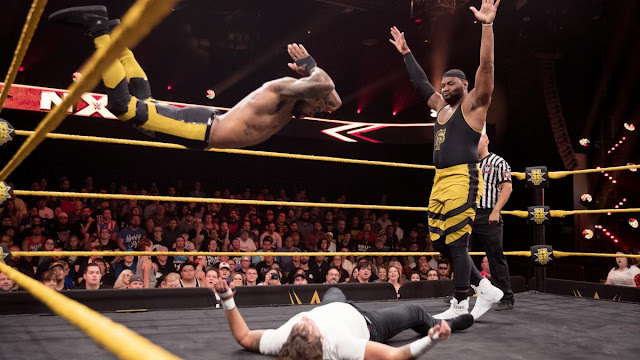 The fact that I’m still on the fence about Almas and Vega and my feelings about the Street Profits stopped this episode from being great, though. This episode gets a B-. Almas/Gargano would totally work nicely with how Gargano tends to be a really convincing babyface in peril, while Almas is starting to lean more into his aggression than his Tranquilo. Also, I need more Burch/Oney beating the crap out of each other in my life.